from Amazon @ $52.99 ea. 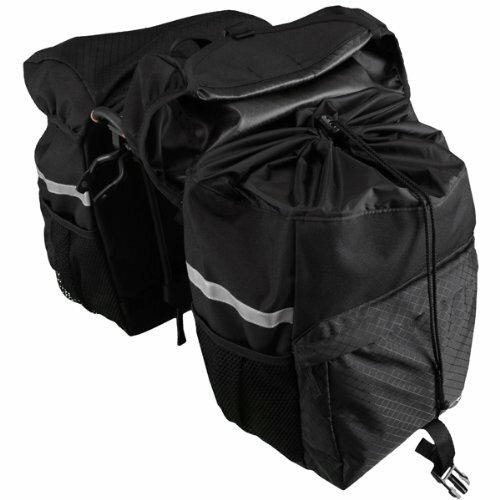 The BV Pannier Set is made for the cyclist who needs lots of space for oversized gear. Top-loading with a drawstring enclosure - Keep oversized or overflowing items secure, while the elasticized top panel stretches over and buckles down to protect bag contents. Compatible with most bike carriers - Mounts easily with two top hooks and a quick-release clamp that fits most bicycle racks. 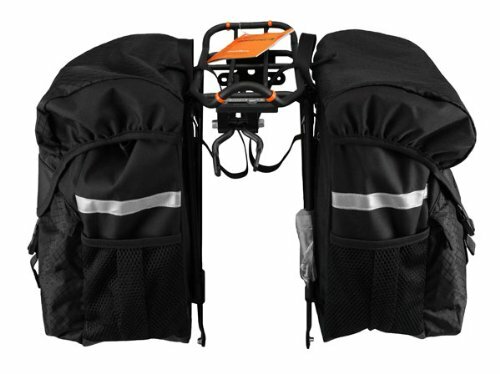 The bottom adjustable hook can further secure the bag onto the rack, so you don't need to worry about the bag moving around on the rack. Hand carrying handle - With a hand carrying handle, it is easy to take off from the bike rack for off-road use. Elasticized mesh pockets for water bottles - Each pannier is furnished with a pair of elasticized mesh pockets generously sized for water bottles and other immediate access items. Safe night riding - 3M Scotchlite reflective banding on the sides and light hangers on the top panel of each pannier ensure night time visibility. 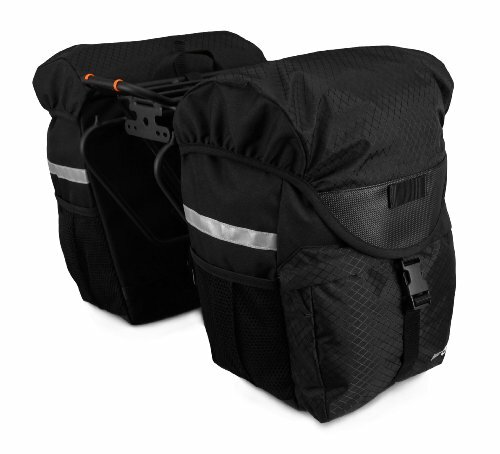 Rigid back panels - Each pannier has a rigid back panel that maintains bag structure for easy access to contents on and off the bike. Non-scratch hook - All hooks are designed to protect your paint job, with rubber sleeves sheathing the metal for scratch-proof contact with bike racks. 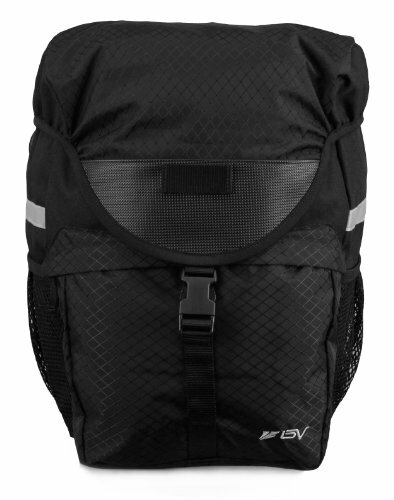 Material: 600D polyester, 420D nylon (rip-stop), 1000D Cordura. Carrier Attachment (each): 2 top hooks and a quick-release clamp, bottom adjustable hook, Velcro strap. Carrier Compatibility: Fits most bicycle rack carriers. Dimensions (each): 12.6 in x 7.9 in x 15 in (32 cm x 20 cm x 38 cm). Weight (pair): 2.5 lbs (1.1 kg). 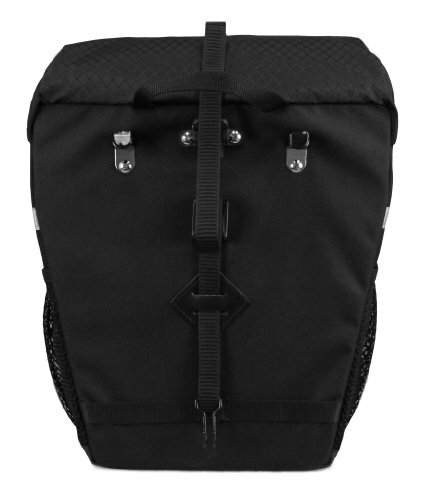 Rigid back panels/ Non-scratch hook - Rigid back panel that maintains bag structure for easy access to contents on and off the bike. Safe night riding - 3M Scotchlite reflective banding on the sides and light hangers ensure night time visibility.